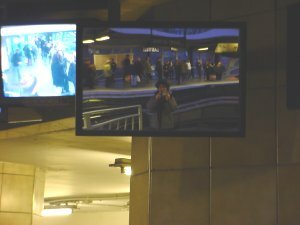 The Mirror Project | JJ Casalonga | Bastille Subway Station | Bastille Subway Station, Paris, France, European Community. Bastille Subway Station, Paris, France, European Community. I cheated ! The picture was REALLY too dark, so I had to add more brightness. Heather, will you ever forgive me ? I know I am not perfect. But you can ask my friends : I'm trying my best to stop using the flash, I'm trying to look at the camera, and not at me, and I try to write something funny for other people to read. Heather, if I promise not to digitally alter my pictures, will you talk to me again ? PULLEEAAASE !!! !